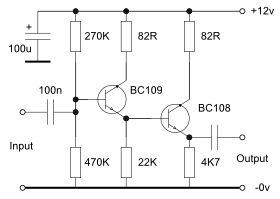 Circuit 1 has a lower output current capability than circuit 2. 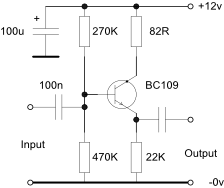 Note: Emitter and Source Followers can oscillate with inductive input loads like screened cables. If this occurs place a 100R resistor in series with the input close to the device. 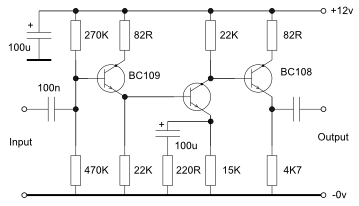 This circuit uses a bootstrap feedback to increase the input impedance with a minor increase in output distortion at higher input levels. 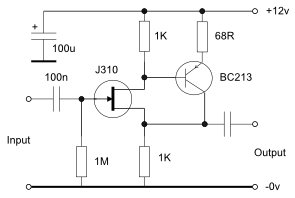 This circuit uses a Junction FET to provide a very high input impedance determined by the gate resistor. The distortion should improve with a higher supply voltage subject to the device specification. 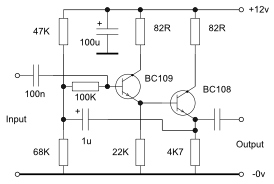 This circuit uses a Junction FET followed by a pnp amplifier and negative feedback to reduce the low level distortion in circuit 4. Increasing the supply to 24V reduced the distortion at 2v ouptut to 0,12%. The minimum setting is with the slider at the 0v end. As the collector has an almost constant current characteristic the output impedance is effectively the value of the collector resistor i.e. 4K7ohms. 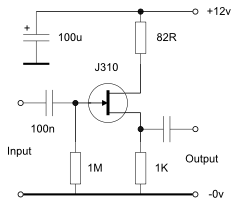 Simple single stage amplifier measured at three settings of the emitter potentiometer. Capacitor values are for voice communications applications so will need to be increased for HiFi uses. Onset of clipping at output level = 7v pk-pk. Output clipping is not symmetrical so for minimum distortion the circuit should be used at output levels well below the onset of clipping. The input impedance is the impedance seen at the base in parallel with the base bias resistors. 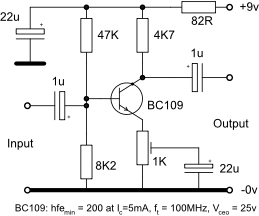 The BC109 is a low noise but older European design transistor which may be replaced with a more modern type with an equivalent specification.